I once knew a guy who tried to convince me of the Crystal Method’s worth by claiming “this is what Luke Skywalker would be listening to while blowing up the Death Star, not John Williams!” Imagining such a music-image combination did nothing to sell me on either of these pop artifacts (whatever did happen to the mainstreaming of electronica? ), but it sparked a possibly improved idea: a film in which the epic mysticism of 2001: A Space Odyssey screams to warp-speed and the action/adventure of Star Wars gets placed in a grander but grounded context, accompanied, if one so wishes, by appropriate hyper-synth washes and breakbeats. Sci-fi for the post-MTV generation? Perhaps. But it’s safe to say that the amalgamation of “serious” science fiction and unabashed thrills has yet to find its fulfillment. Sunshine might not be that fulfillment, but it comes close. At the very least, it refuses to put on the deadweight of pop philosophy, religion and psychology, as have recent high concept sci-fi films like The Fountain, Mission to Mars and Solaris in their feeble efforts to emulate the insurmountable magnitude of 2001. That’s because there’s a lack of pretension, if not a complete avoidance of preposterousness, in Danny Boyle’s direction. Where Aronofsky, De Palma and Soderbergh overreach for the heavens to ponder the human condition, Boyle lets the stars speak for themselves. Or itself. Sunshine involves a space crew on a mission to reignite the sun, and the stakes of such an endeavor are enough to provide the film its epic proportion without contriving questions about God and the universe. Sunshine is about awe of a different sort, the rush of sensation replacing a humbled contemplation of the cosmos. The vastness of the infinite, I imagine, can allow room for both. At the very least it allows room for Boyle’s singular but limited style. In the past, his tendency to construct entire films out of montage sequences — punctuated by audacious camera angles, movements and compositions — has been a stylistic forte, as well as an Achilles’ heel. Shallow Grave and Trainspotting added to the Hitchcockian thriller and the drug movie, respectively — an up-to-the-minute flair that put Boyle on the map in the mid-Nineties. But they also presaged the director’s inability to sustain a relentless pace of exclamation-point shots not only over the course of a feature length film, but over the course of a career. 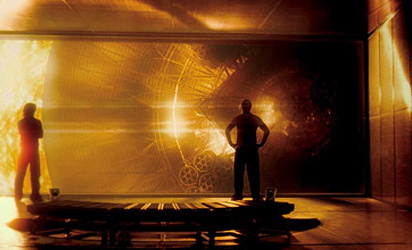 Like so many postmodern directors (Aronofsky, Tom Tykwer), Boyle designs his films to move, yet cinema as perpetual motion machine works only with tight precision, and the frequent slapdash manner of Boyle’s work has put a severe crimp in otherwise promising recent generic exercises like 28 Days Later and Millions. In this regard, Sunshine is perhaps Boyle’s best film to date. Boyle’s ability to wed shots together in a coherent manner hasn’t much improved (the faster the rhythm of the film, the more logic gets sacrificed), but that may have to do with the fact that we’re experiencing a film that takes place at exaggerated speeds and dimensions. Even when one falls behind in making sense of simultaneously unfolding scenes or human-machine ballets, one soon catches up in moments of sheer exhilaration, as when we travel at the side of Capa (Cillian Murphy) in his spacesuit as he violently launches from one space vessel to another.